Dan Q is a thirty-something geek-of-many-hats. He lives in Oxford with his partner and her husband in V-shaped, open, polyamorous relationship – collectively, they call themselves the Earthlings or,more often, the Greendalians. The three of them met at Aberystwyth where, at some point or another, they were all students. 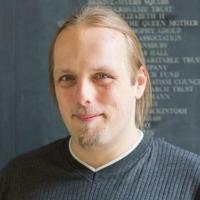 He works at the academic libraries of the University of Oxford, looking after their website and digital presence. Since the early 2000s, he’s done voluntary work with Three Rings, which provides management software to charities and voluntary organisations. He’s also volunteered for a variety of other organisations, principally providing emotional support services. He’s put a degree in counselling and psychotherapy on hold while he completes a masters degree in information security and digital forensics. He enjoys a variety of computer-related pursuits, performing magic, collecting and playing board games, and geo*ing. Click any of the links on this page for more information and further reading, or just trawl the 18+ years of his blog.